Whether your eyes hurt from straining, or simply from concentrating, can negatively impact your vision. This happens when your eye muscles need to “stretch”. However, most of us cannot afford to walk away from our work for extended periods of time, and so must push through the headaches, blurred vision, and dryness. 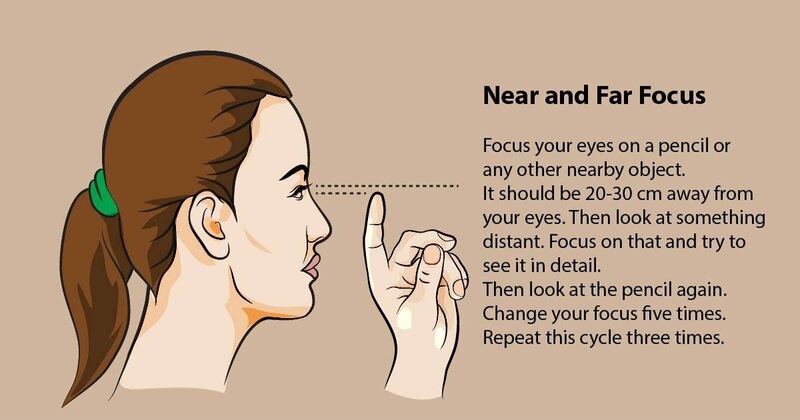 Fortunately, there are 10 eye exercises to combat eye fatigue and improve your vision. You don’t even have to find a dark room to perform this exercise. 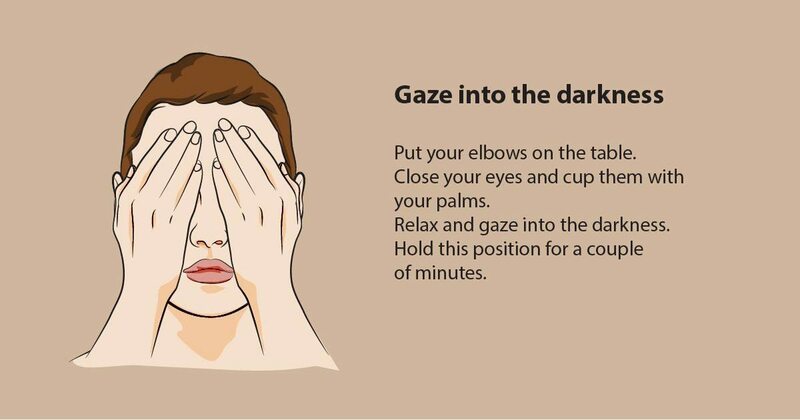 Simply place your hands in front of your eyes and stare into the dark hollow for a few minutes. To make the most of this technique, place your elbows on your desk or another hard surface, rest your head in your hands, and just relax. 2. Move Your Eyes From Side to Side. You might look like a crazy person if your colleagues see you doing this, but moving your eyes from side to side can remarkably improve your concentration and vision. Glance left, focus on what you see, and then glance to the right. Do this five times. Repeat the whole cycle three times. 3. Move Your Eyes Up and Down. Again, you might look a little strange doing this exercise, but you’ll be the one laughing when your eye for detail becomes much stronger than that of your coworkers. First look up, concentrate on what you see, and then look down. Do this five times. Repeat the whole cycle three times. 4. Move Your Eyes Diagonally. This is where the eye exercises start to get tough. 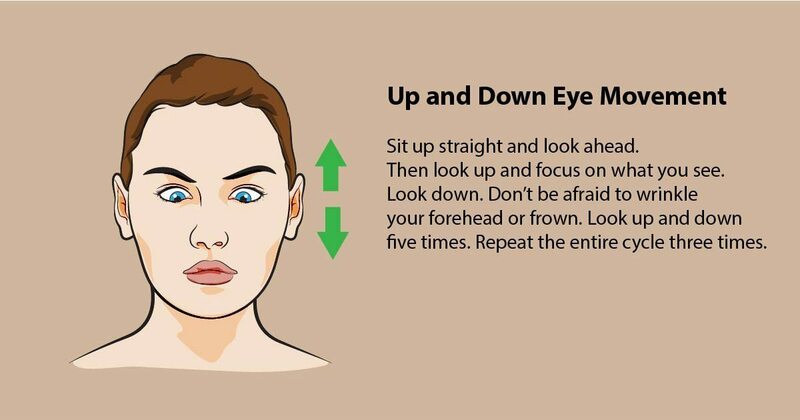 Start by looking straight ahead, and then look down and to the left. Move your eyes in a diagonal motion towards the upper right. Focus on what you see, then move your eyes to the bottom right and diagonally toward the upper left. Repeat the exercise five times, and repeat the cycle three times. Sit up straight, take a deep breath, and relax. Then slowly roll your eyes to the left, and keep rolling until you’re looking straight again. Do this five times in a clockwise motion, then five more times in a counterclockwise motion. Repeat the cycle three times. 6. Focus Near and Far. Take a pencil, pen, or another small object and hold it half an arm’s length away (bend your elbow). Look at something in the distance, focus on it, and then focus on the pencil. Look at something far again, and then bring your focus back to the pencil. Do this five times. Repeat the cycle three times. Sit up straight and relax. 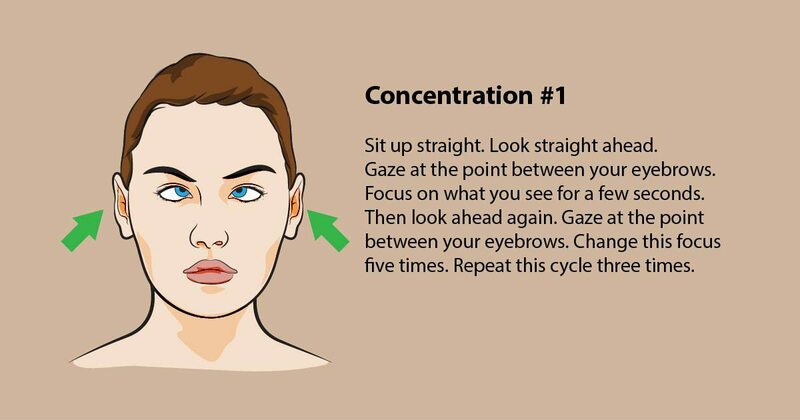 Bring your focus to the point between your eyebrows, concentrate on what you see, and then look straight ahead. Repeat this exercise five times, for three cycles. Continue to relax and looking forward, but this time when you focus, focus on the tip of your nose. 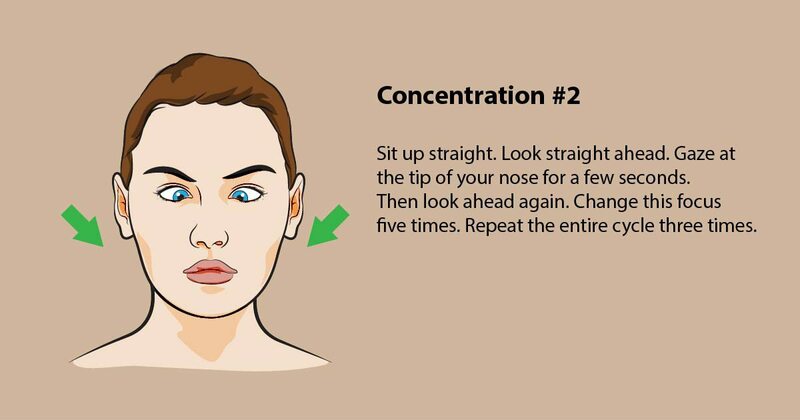 Look up and concentrate on something in the distance, then look down at your nose again. Do this five times. Repeat the cycle three times. Close your eyes and squeeze them tight. Keep them this way for two to three seconds. Then, without opening your eyes, relax the muscles around your eyes. Keep them rested for a few seconds, and then squeeze them tight again. Repeat this exercise ten times. 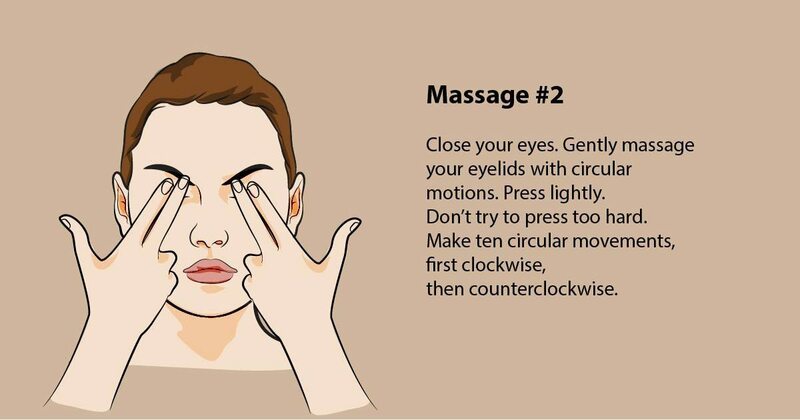 To wrap up your eye exercises, close your eyes and then gently massage the eyelids in a circular motion. Don’t press too hard, as this will strain the eyes. Do ten circular motions in a clockwise motion, and then ten more in a counterclockwise motion. Just like all the muscles of your body, your eyes need exercise to perform at maximum capacity. However, on the same token, if you work them too hard they become strained and start to wreak havoc on other parts of your body (i.e. the headaches). These tips have received great feedback from people who have tried them, so if you’re feeling extra tired or feel a headache coming on, give these tips a try. You won’t be disappointed! Previous ArticleThis Guy Dumps Carrots In The Toilet. You Will Be Surprised To See What Happens Next!